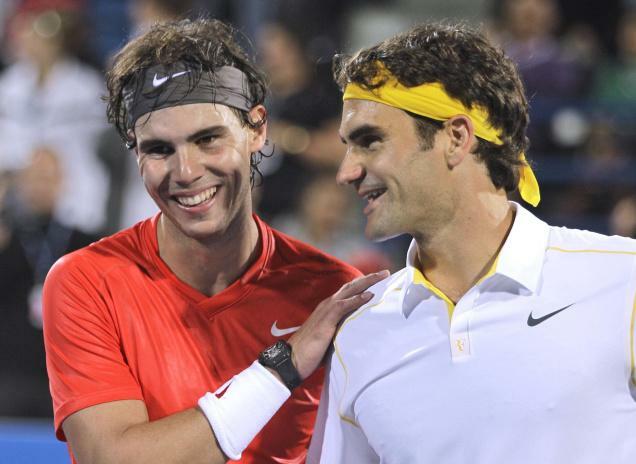 Has there ever been a conversation, article or other examination of Rafael Nadal that didn't pivot on his rivalry with Roger Federer? Well, I'll say, it's not exactly our fault, the Federer kid just stays in the picture. I've been among the bloggers (dare i say, writers?) who've written in the past that they can't ever foresee such a conversation happening. Nadal's own book Rafa centers on the story of Nadal's side of the Greatest Match of All Time (the GMAT? ), his 2008 Wimbledon final versus you know who. It's understandable, the two players are not merely rivals or two of the best players in the world today, but all hyperbole aside, they are two of the greatest tennis players in the sport's rich history. Where there was a decade between Pete Sampras and Federer (the two only crossed their Wilson racquets once in a tour level match) Nadal and Federer began their rise nearly simultaneously. Although Federer is a few years older, the Swiss man claimed his first major in 2003 at Wimbledon. Federer would first face the other budding all-time great, Nadal, just seven months later at the 2004 Key Biscayne Masters, on Federer's preferred hardcourt surface. Let the record show, Nadal won that match in straight sets. Nadal would miss the 2004 French Open with a foot injury, but the following year, 2005 Nadal would claim the first of his majors in Paris. That would be the first of four consecutive years that Nadal fended off Federer on his preferred clay. Eventually, each man would conquer the other's strongholds. Federer would win in Paris where Nadal reigned; Nadal in Melbourne, Wimbledon and New York each won multiple times by the Swiss man. I've written it before, but I must repeat the most compelling statistic of their coexistence here. Only seven men in the sport's history have attained the career Grand Slam (just four in the Open era), two of them are Federer and Nadal. But enough about that other guy, he's certainly a helluva player too, but enough ink has been spilled about Federer in recent years, we turn our focus to the other great, Nadal. There are certainly more records, more statistics, more ways to quantify the greatness of the Man from Mallorca without endlessly referencing the other guy, but the most telling is in the way he plays. Watching a Rafael Nadal match is like watching a war before your very eyes. While you may be viewing from a safe distance, there is no doubt of the carnage unfolding on the field of battle. First, Nadal takes the legs, running his opponent side-to-side, up-and-back, like a crazed dog chasing a squirrel in the park. Then he takes the heart, running down perfectly struck dropshots from a dead start, curling shots savvily sliced out wide by his opponent, right back past them to land, presumed trajectory-be-damned, smack on the sideline; good, a winner from a seemingly impossible position. If that's not enough, he takes the will. Winners against mere mortals come back two, three, four times a point; until Nadal either wins the point or leaves his opponent so starved for oxygen that he can barely contest the next three. Most of the top players can find that kind of form a few times a match, maybe even across a set. Nadal, again, is not average. When he's at his best, he can play at that level for three, four, five hours. Oh, there's more tennis to play? Nadal, dark hair limp from sweat, ever-present bandanna perspiration-dyed a darker shade than the one he donned to start the match, newly clad in his fourth fresh shirt of the day, sprints to the baseline ready for more while the opponent often uses the last of his will just to emerge from his seat after a change of ends. 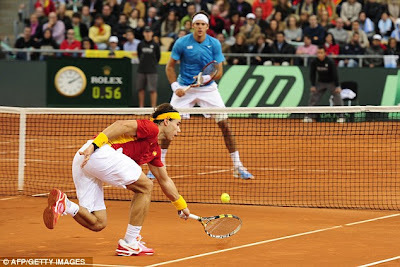 Witness today's win over Juan Martin del Potro to clinch the Davis Cup for Spain. Del Potro, a former (and likely future) top five player on the rebound from an injury that cost him a year from what promised to be a spectacular career started off on fire. He took the first set from Nadal 6-1 in a little over 60 minutes; his whiplashing forehand pushing the Spaniard back behind the baseline likely with visions of a certain Serbian player dancing horrifically in his head. After four hours, Del Potro was broken, humbled and would end the day in tears. He couldn't muster a single point in the fourth set tiebreaker. After a spotty start, the Spaniard found his game and ripped the Argentine out of his. Nadal applied the pressure (to himself at times too), but it was Del Potro who finally cracked, losing 1-6, 6-4, 6-1, 7-6 (0). No less a racquet-wielding warrior than Jimmy Connors said of Nadal, "He plays like he's broke," and the American is nothing if not accurate. Even the "easy" wins are often on a razor's edge, which is as indicative of tennis' scoring system as it is Nadal's penchant for winning on guts and guile more than on raw talent. Nadal matches are never coronations, every swing of the racquet, every point he tends to play as if his life depends on it. Where some players may toy with an opponent once they have a "safe" lead, Nadal never allows surrender; nor does he seem to want it. He has a virtually unfathomable fire to win the big matches, that burns with an intensity rarely seen. Unless it doesn't...and sometimes it doesn't. The tennis press (bloggers included) can be a famously reactionary group of people, and no wonder when there's a new set of rankings every week, a new tournament (or three) every week from January - December and a flavor of the month at least a couple of times a month. Someone's always rising, which means someone's always falling. Someone's always breaking through, which means someone's always falling back. That's the circle of life, and it's the nature of tennis. The story of Rafael Nadal is as much one of relentlessness as it is one of the consistency of that effort. He finished the 2005 season ranked No. 2 in the world. The cycle of tournaments is pitiless and many a critic has said that between the hamster's wheel that is the tour and the pounding nature of Nadal's game would mean his career, however brilliant, would also be brief. How can a man who plays that hard, physically and mentally, play for very long, especially at the very top level of the sport? Seven years later, in 2011, Nadal finished the season ranked...No. 2. Since 2005, Nadal has ranked either 1st or 2nd in the world at year's end. The only other players in recent memory to have approached that kind of consistency over such a length of time: Sampras, Graf, Navratilova, Federer...not bad company. In that period, Nadal has also always claimed at least one major title every year. Still, just as they had after the US Open, the press cried wolf coming out of the ATP WTF in London this year. 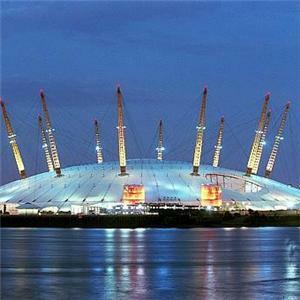 Nadal easily qualified for the season-ending tourney, but once he arrived at London's O2 Arena...which for the record, looks like some sort of metallic porcupine, he lost two of this three matches and was eliminated in the round robin stage. Was the Nadal narrative shifting yet again? Was the man mortally wounded by the rise of Novak Djokovic in such a way that he could barely muster a challenge to his career rival, Federer, in a tournament he had never even won?!? Looking at Nadal's history, I shrugged and assumed the following: the fire wasn't burning. For the record, I alluded to the likelihood of that being the case before the tournament. "I was little bit less passionate for the game...I'm happy how I practiced the last three weeks, but to compete, I wasn't in the right way. We can find excuses, we can find problems, but it's not the moment to say that." 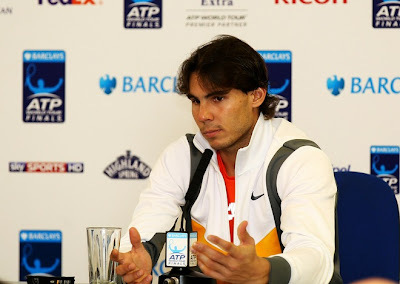 Nadal all but shut down his 2011 campaign after a less-than-stellar run in Asia, but decided to play two remaining events, the ATP WTF and the Davis Cup final. Anyone who's watched the Spaniard over the years knows that it takes him a bit of time, a few matches, to reach top speed. While some players *cough*Serena*cough* can sit out six months to a year and come back looking like a world-beater all over again, when Nadal takes a month off, his preternatural timing suffers. Nadal is famously a rhythm player, so anyone expecting him to win (or seriously contend for) the WTF after taking a month off on a fast indoor hardcourt was missing the point. While Nadal is a world-class competitor and wouldn't get on the Eurostar hoping to lose, all indications pointed to the tournament being a glorified practice session for a Nadal with an eye toward ending his year back on the red clay, hoisting the Davis Cup with his Spanish teammates. In other words, ending a difficult 2011 with a flourish back at home in Spain. Six final round victories over Rafael Nadal. It's hard to say which of the two figures is the more impressive. The history books would of course, consider Djokovic's triple major season the bigger, as it ranks clearly among the best in the sport's history, but the six wins in finals over Nadal are equally massive. Whereas Djokovic has often been considered "soft" in the big moments, Nadal has alternatively been the steely big match player. Consider that Nadal came into 2011 a comfortable 16-7 versus the Serb. Their head-to-head is now virtually even at 16-13. Nadal opened the year a remarkable 43-13 in finals; he would leave 46-20, with six of the losses at the hands of Novak Djokovic. Nadal is the man who clinched Spain's 2004 Davis Cup title as an 18 year old; who single-handedly (on the forehand at least) turned back four Roger Federer attempts to win Roland Garros; who won Wimbledon twice despite being a considered in some circles merely a clay courter etc., etc. Six times in a row, Djokovic found himself the better man on the day; twice on Nadal's beloved red clay once even in Spain. In the moment, the losses could be rationalized at first, but then they became as irrational as they became fact. In reality, Nadal's season can be looked as a glass half-empty, Djokovic's mastery-come-lately over Nadal has been as much of a blindside as it has been comprehensive; or as a glass half-full, Nadal spent most of the year beating back the rest of the field and then taking shot after shot from Djokovic in the finals. This year changed people's perceptions of Nadal in many quarters, but it should have reinforced at least two things about him. First, that he never says die, and second, when the fire's burning, he's a deadly opponent. No, the numbers didn't change, Djokovic did beat Nadal in six finals this year, but the Spaniard kept coming. There would be no prolonged swoon like when Djokovic knocked off Andy Murray in Australia. Nadal powered through the rest of the field at every time of asking and then tilted at the same windmill, err buzzsaw, at the final hurdle. 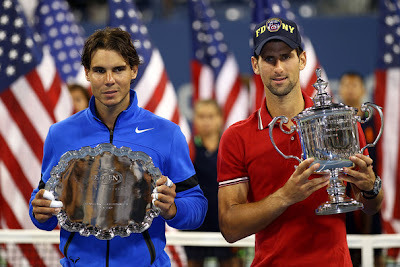 While both Nadal and Djokovic faded precipitously in the fall, Djokovic ended his season with a whimper losing to his compatriot Janko Tipsarevic, the alternate at the ATP WTF; Nadal ended it with a statement by winning the Davis Cup and a bit of redemption for his dizzying season. Ultimately, Novak Djokovic will do no more to define Rafael Nadal than has Roger Federer. They will always be seen as rivals, having played in the same era, but each have their own place in the pantheon of tennis history. Nadal has already established himself, without qualification, as an all-time great. What we've already seen from the Spaniard is incredible and presumably he has a few more years to add to his legacy, But what defines Nadal? Simple, will. When Nadal's both healthy and mentally engaged, it takes a superhuman effort to beat him. He might not be the most natural talent to swing a racquet, but I've never seen a tennis player, or hell, an athlete period, with a stronger will than Nadal. Winning the tournaments he has won, over the players he has beaten, for years on end is more than just the triumph of skill, practice hours or talent. 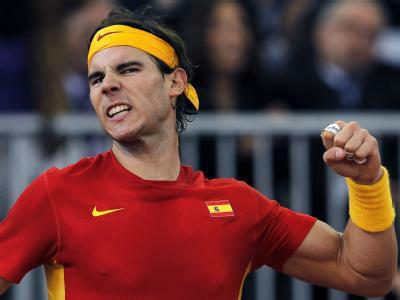 It's the manifestation of the sheer force of will that is so strong in Nadal. To get up from the canvas time after time, after being laid low by opponents and injury, and find a way to bludgeon your opponents over and over again, that's will. That's what Nadal, who hadn't hoisted a winner's trophy since Paris, showed today and it's what I expect to see even more of from him come 2012. Yes, that's what I first noticed about Nadal (hard to miss it) back in the classic 2005 Coria match in the Italian Open. He was 18. It was before is first French Open title. And he played like he would continue to play, against a superior talent (no matter what anyone says, Coria is clearly a clay-court maestro, and will always be), like an irresitable force. Happy for Rafa, because we haven't seen as much of that care-free teenager in recent months. Rafa even commented on that a few days ago -- words to the effect that its different to be 17/18 and never having won anything yet. Very nice article! I'm adding your blog to my pile for frequent visits. Thanks for the nice article V.
Willpower, endurance, passion and sportsmanship. It can sound strange, but I value sportsmanship the most in above counted and Rafa has it more than any top player nowadays. @necudaseigram I have to say Rafa is among a group of very sporting players at the top of the game right now. Thanks for checking out the blog. I forgot to mention humor. Please check this link.